You have seen gold, learned about gold (remember the periodic table? ), and perhaps even dreamed of owning gold. But have you ever TASTED gold? Now is your chance to indulge your taste bud with a little luxury – a little 24k gold/silver-layered ice cream luxury that is. 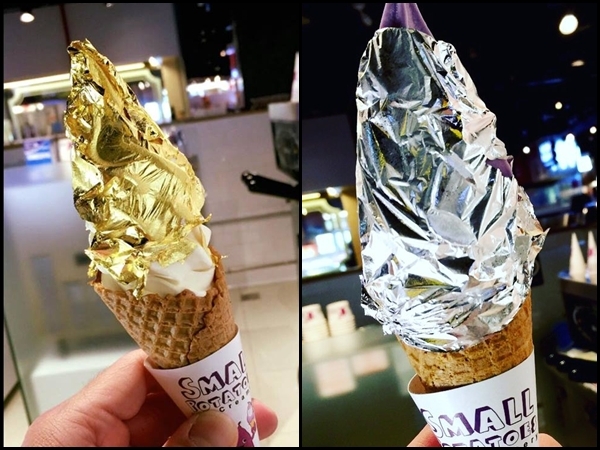 The Small Potatoes Ice Creamery in Singapore recently released their Sea Salt Caramel with Gold Leaf and Purple Potato with Silver Leaf ice creams, priced at SGD12 and SGD10, respectively. Don’t get discouraged with the price just yet because both gold and silver leaves are Japan-imported, made from actual food-grade 24k gold (basically meaning that it is an edible bling). The Japanese believe that consuming gold can aid in maintaining youthfulness and prolonging life span – but if you are not into that, just do it for the 'gram. If that’s not enough, only Hokkaido milk is used to produce the soft serve. Based on the Kinkaku Soft Serve Ice Cream's creation, those in the land of the rising sun can find these special desserts in Kinkakuji (the Golden Pavilion) just outside of Central Kyoto, Japan. Those who aren't in Japan, just head on to Small Potatoes Ice Creamery branches located at Somerset 313 and Novena Square 2 to get a taste of the rich life. Be mindful that these edible luxuries will only be in stores until they sell out, so best make your purchase quick.